the max-flow min-cut theorem states that in a flow network, the maximum amount of flow passing from the source to the sink is equal to the total weight of the edges in the minimum cut, i.e. the smallest total weight of the edges which if removed would disconnect the source from the sink. Yet, if I sum up all top edges I get $17$, whereas the maximum amount of flow passing from the source to the sink is $18$. The orange nodes certainly do not form a cut. A cut is never a set of nodes, but has to be a set of edges. You should be trying to disconnect the source from the sink by removing edges, while leaving all the vertices in. The minimum cut is the cheapest way to do this. In this network the minimum cut consists of the two edges of capacity $4$ from the source, together with the four edges of capacity $3$ leaving $FM_1$ and $FM_2$. These total $18$. The edges $I\to EM_1$, $EM_1\to 1$ and $1\to O$ do not form a cut because after removing them you can still get from $I$ to $O$ (e.g. via $EM_2$ and $2$). Not the answer you're looking for? 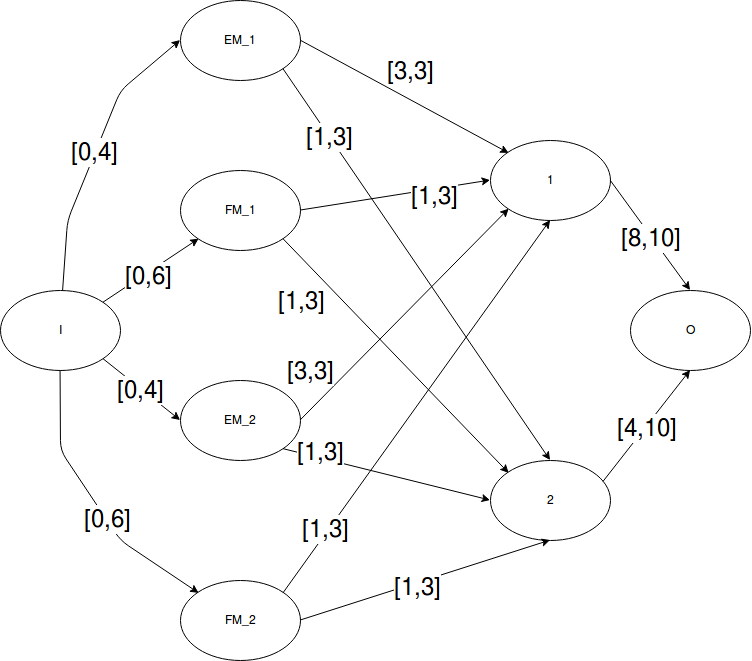 Browse other questions tagged graph-theory network-flow or ask your own question. What's an intuitive explanation of the max-flow min-cut theorem? 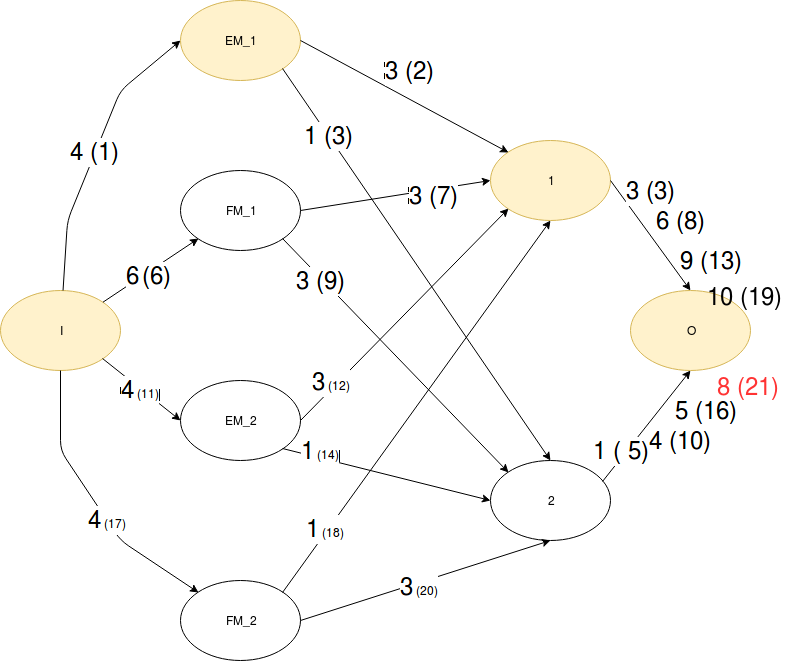 Network flow: Why is min-cut determined by unsaturated edges? Finding a minimum cut for an (s-t) flow: why not just cut the start/end edges? Is it possible to have a weighted graph (integer weights are also ok) where the max flow can be obtained in a non unique way?